The Kids' Club is the perfect place for our younger guests to learn skiing under the tutelage of our responsible and experienced ski instructors. 'Sölli' the marmot - our Kids' Club mascot - guarantees a fun and secure environment for budding skiers aged 4 and up. 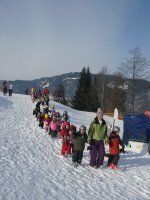 The Alpin Skischule Oberstdorf has a specialized area set aside for our younger skiers. Supervised by our experienced staff, the kids can learn to ski in a fun and safe environment. With a magic-carpet, tow-lift and conveyer available, the setting is perfect for the next generation of skiers to find their feet. Procedure: We meet at 9am at our ski school in Oberstdorf directly opposite the train station or at 9.30am in the rental centre of the Alpin Skischule Oberstdorf at the Söllereckbahn. The ski lessons take place from 10am to 3pm - including a supervised lunch hour (€ 6,- to € 10,- extra cost). A perfect day having fun, meeting new friends and enjoying the natural environment! Children's courses start every day!